We took a drive down to Orlando and picked up my sister who had been attending a work conference this week. On the way home, we stopped at one of our favorite restaurants. It was a delightful time! Mom has been working on this crocheted table cloth this winter. She got a lot done inspite of her adventures! This tablecloth will have 80 of these motifs with the patterning between each block. A work of art! I finished the sweeater for Abigail on the drive! On to the matching one for her mom! I also have some pink yarn ready to go on the needles for a pair of socks. It looks like this hibiscus! Barb and Doug and friend, Esther, came for the day. They are wintering a few hours south of us so it was nice to have them come and see the changes in the house since their last visit, two years ago! Caleb had the day off and came to see his grandparents, parents and his Aunt and Uncle! We had a great meal together and lots of laughs over the card games! So nice to savor family time! On my needles, 3/4 of the way through A's sweater! Heading to the finish line now-a few more inches and then the folded hem. 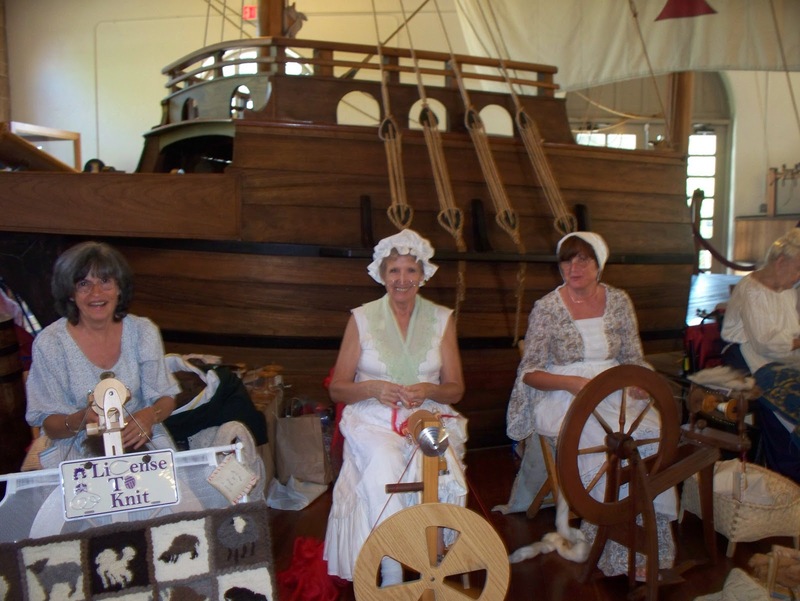 The Textile Guild of St Augustine held their annual Spin In today and I attended with two friends (pictured is Jewel, Elayne and me). We joined a group of about thirty spinners, rug hookers, knitters and spindlers to share what we know about fibers with the visiting public. You would never know the economy is slow because there was a very large number of people we spoke with today! Hundreds, in fact, came to the Welcome Center on their way to tour the Oldest City in the USA! Most of us were in costume and it was so nice to be able to share our appreciation of wool and cotton with those who stopped by. Children wanted to touch and try-we had hand cards and wool for them to handle; adults wanted to know how the wheel worked and what we did with the skeins of wool! It was a great way to spend a day! Our fringe tree is in full bloom! It smells heavenly, too. The blooms are large-12-15" each cluster. The mexican daisies are still doing their blooming thing. This little shurb is covered in little white flowers, alas, I do not know his name! This is in the lily family, it grows wild but we transplanted a few bulbs and they bloomed this time! Some of the morning glories have come up from last year-more to come. I finished the tablerunner. I will save it for Mother's Day, as it was gifted ahead of time for that occasion! A new sweater in on the needles, a cotton summer sweater for Abigail. sweetie to wear﻿ it for next winter! I hope you share the beauty of your first day of Spring with us, too! and bromileads on the palm tree trunk. I hope you took some time piecing, cutting, perusing or thinking about quilts today! Our car was due for an oil change (free at dealership) so this means a trip to Daytona! The dealership provides a shuttle for transportation while you wait for your car to be worked on-Mom and I opted for JoAnns while the men browsed at Target. We filled the van with our purchases! Back to the car, we had worked up an appetite! And knew just where to whet it! While in the car, I worked on Mom's mitts! Finished! We took a pitstop at the flea market and then stopped at McDonald's for a sunday. What a great time we have together! When were arrived home, I worked on the latest clue for the Mystery 220- "IT" is shaping up nicely, whatever it is?! Bill and I bought a flat of Plant City strawberies when we went into town this morning. When I got home, I gave Mom a call.....Oh, how wonderful to have another woman in the kitchen to make some jam; especially when it is my owm Mother! What a great time we had. Instead of work-it was fun! Twenty jars for the pantry! On the fiber front, Mom has passed on her silk knitting on to me! I am making good progress on the first mitt. I will make these a bit shorter than mine to fit Mom, and silk stretches rather than bounces back like wool. Definitely has its own charm but is SO different from wool! Poke a hole in the center and pull the circle out -you will hear/feel the fibers slide by each other. Continue drafting out the circle of silk until it is the same size around. Break one side and knit from your lengthn of silk 'yarn'. I finished my pair of mitts! They have been washed and blocked. I will be saving them for a chilly morning-right now we are having a very warm spell-80's! Nyki is glad to have me home all day, too. She hasn't left my side. It is good to be a lump and to rest today. so I can get started right away on the second one. My body is in slow-mo but my hands are in gear! Perfect way to recouperate from a few hectic weeks! ...becasue people come and go so quickly around here! There was a pair of osprey hunting overhead. Just beautiful to be by the water anyway! Said goodbyes to Bob and Shelly this morning. Mom and I took part in some sewing/quilting to take the edge off their absence. We finished piecing our tablerunners. This is mine-piecing on the back , too! And Mom's. We missed you , Marsel, so you will have to send pics of your finished work! I am working on my fingerless mitt.........this silk project is a huge success. I can't wait to wear these! I am keeping track of how many hankies it requires so I can record the stats for this pattern! It is an excellent knit if you want to join in!